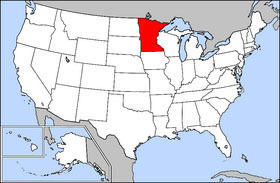 Minnesota is the 32nd state of the United States, having joined the Union on May 11, 1858. Its name is from the Dakota people's name for the Minnesota River, mini sota, variously translated "smoky-white water" or "sky-tinted water". The state's name is abbreviated Minn. or MN. The USS Minnesota was named in honor of this state, as was the SS Gopher State. Originally inhabited by Native Americans, in particular the Ojibwe (Chippewa, Anishinaabe) and Dakota, although the Ho-Chunk also had a presence in the southeastern part of the state. Minnesota was designated a territory on March 3, 1849, but that territory was not coextensive with the present state, since the territory included what later became the territory of Dakota, and later still became the states of North Dakota and South Dakota. 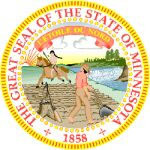 The eastern half of the territory of Minnesota became the present state of Minnesota�the 32nd state�on May 11, 1858. Executive. The current governor�Tim Pawlenty, a Republican�started his term on January 6, 2003. Federal cases are heard in the federal district courts in Minneapolis, St. Paul, or Duluth. Minnesota is part of the Eighth Circuit Court of Appeals, which is located in St. Paul. Appeals beyond this level go to the U.S. Supreme Court in Washington, D.C.
After its rivers and lakes, Minnesota's most prominent physical feature is the Iron Range. This is a range of low mountains that run across the northern part of the state. It is called the Iron Range because when discovered, it had some of the largest deposits of iron ore in the country. Although the high-grade iron ore was mostly mined out during World War II, taconite is still mined across the Iron Range. The average state income in Minnesota in 1999 was $30,742 (according to the State Demographic Center the Northeast Midwest Institute gives the figure as $30,793). This compares to a national average of $28,546. The average household income in 1999 was approximately $48,000, ranking eighth in the nation (U.S. Census Bureau). The county averages range from $17,369 (Todd County) to $42,313 (Hennepin County, a portion of the Metro area). In general, salaries are lowest in more rural areas, particularly in the northwest portion of the state. The Twin Cities are home to a diverse range of major businesses, including 3M Co. (formerly Minnesota Mining and Manufacturing Co.), Northwest Airlines, Target Corporation (including Target Stores and Mervyn's), U.S. Bancorp, Thrivent Financial for Lutherans (formerly Lutheran Brotherhood), Medtronic, Cray Computers, Imation, and a regional headquarters of Wells Fargo & Co. The city of Rochester is the headquarters of the Mayo Clinic, and has a significant manufacturing presence in International Business Machines. The largest shopping mall in the United States, the Mall of America, is located in Bloomington. A large proportion of the state's economy is still agricultural. Additionally, northern Minnesota is a source for iron ore and wood products, though these are both declining industries. A fair amount of ethanol alcohol fuel is produced in the state, and a 10% mix of ethanol into consumer gasoline has been mandated since 1997 (as of 2004, Minnesota is the only U.S. state with such a mandate). If production capacity meets the need, 2% biodiesel will be required in diesel fuel in 2005. Many farmers also now operate windmills to produce electricity, particularly in the windy southwest region.